Come hear award-winning and nationally renowned professionals share their expertise. These popular afternoon lectures coincide with monthly morning meetings of the Landscape Design Students and Alumni Association. All are welcome to register. Registration fee for each class: $29/$35. Register for three or more over the phone (718.817.8747) and receive a 10% discount. October 23, 2018; 1–3 p.m.
Matthew Urbanski will describe his approach to highlighting delight as a design imperative and how this translates into creating memorable environments for play. The core impulse behind garden-making is the pursuit of delight. Similarly, landscapes of play exist solely to give children delight through the fundamental human activity we call play. Like delight, play takes many forms, as will be illustrated in the range of projects discussed. Matthew Urbanski, a Principal of Michael Van Valkenburgh Associates, has worked for the firm for over three decades where he has been part of the leadership for almost every major project the firm has completed, including Brooklyn Bridge Park, Maggie Daley Park (Chicago), A Gathering Place for Tulsa, and Teardrop Park (Manhattan). He lectures regularly on design of play spaces in the landscape and how spatial complexity, particularly when combined with plants and other natural materials, supports an integration of active and imaginative play. 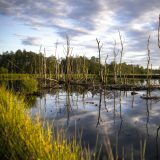 November 27, 2018; 1–3 p.m.
William Kenny, an expert in ecological planning and design, will examine a variety of factors that are essential to extraordinary wetland management. He’ll highlight the successes from restoration projects his firm has completed on relatively small, suburban residential properties, including ones that incorporate creative stormwater management. For over 25 years, William Kenny, PWS, RLA, has created, restored, and managed wetland habitats, in addition to designing and implementing management plans for invasive plant species and stormwater. He is the owner of William Kenny Associates, which provides Landscape Architecture and Ecological Consulting services, and NATIVE, a native plant nursery. His firm is currently involved with the restoration of 36 acres of coastal forest and meadow in Westport, Connecticut. 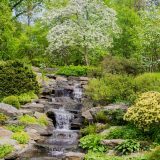 December 18, 2018; 1–3 p.m.
Why do we feel contemplative in Japanese gardens and architecture? Can our physical environment foster mindfulness? Yoko Kawai, lecturer at Yale School of Architecture, examines how Japanese spatial concepts such as ma (in-between-ness), utsuroi (transience), and yugen (the unknown) create the mind-body-space relationship that is instrumental to mindfulness. Elements of tea gardens and teahouses are introduced as examples. Yoko Kawai, Ph.D., is a Principal of Penguin Environmental Design, which focuses on incorporating landscape into architecture. She co-founded Mirai Work Space Alliance that brings “Space for Well-Being” to contemporary workplaces. She has published articles in various scholarly journals, including Journal of Green Building and Journal of Asian Architecture and Building Engineering. January 22, 2019; 1–3 p.m. Drawing on experiences designing more than 45 NYC public spaces, and a lifetime of challenges in her own garden, Lynden B. Miller shares how she looks at a sit—what’s there and what could be—and how she visualizes what plants are needed to achieve her goals. Her training as a painter is a key to educating her eye for garden design. 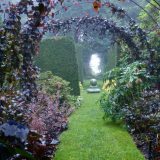 Her lushly illustrated talk will showcase practical ideas for successful gardens that look good in every season. The purpose of her work is to give city dwellers beauty and pleasure in well-maintained public places. Lynden B. Miller rescued and restored The Conservatory Garden in Central Park in 1982. 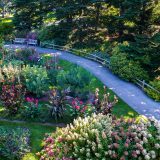 Believing that good public open spaces can change city life, she has since designed scores of gardens and parks, including Bryant Park, Madison Square Park, Wagner Park in Battery Park City, and the perennial borders at NYBG. Her book, Parks, Plants and People: Beautifying the Urban Landscape, won the American Horticultural Society 2010 National Book Award. February 19, 2019; 1–3 p.m.
As temperatures rise and precipitation patterns shift, it is essential for designers to consider how to select, place, and care for plants that will thrive in today’s conditions, as well as tomorrow’s. 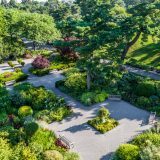 Landscape architect, plantsman, and author Travis Beck discusses how to create dynamic and resilient plant communities that will flourish in the landscape for years to come. Travis Beck is Director of Horticulture at Mt. Cuba Center in Delaware, where he oversees the care and evolution of over 1,000 acres of native plant gardens, landscaped grounds, and natural lands. Prior to Mt. Cuba, Travis managed large landscape design and construction projects at NYBG. 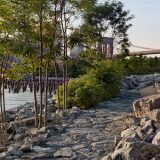 His book, Principles of Ecological Landscape Design, applies current scientific thinking to the design and management of successful, sustainable landscapes.